Dickinson often referred to foreign lands in her poetry and two other sites in the Classroom Electric--"Love and Conquest" and "The Geographical Imagination"--survey many of these. Here, the focus is on a single poem--"He touched me." 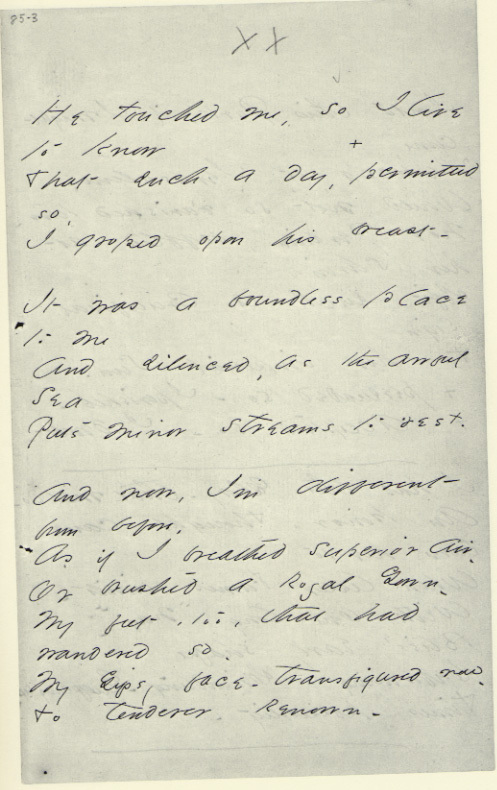 In addition, however, at the bottom of this page is one other Dickinson poem--"It would never be Common." This poem also invokes the East and may be read in the context of nineteenth-century orientalism and Dickinson's idiosyncratic use of orientalist tropes. Publishing history and critical reception of "He touched me." When "He touched me" first appeared in print it was without the last stanza. It is the last stanza, however, that is perhaps most interesting. It mentions two women--Rebecca of Jerusalem and a Persian who is baffled at her shrine (probably a reference to Lalla Rookh)--and both are famous not for traditional female adoration of a larger-than-life heroic male, but rather intense female sexuality coupled with rich spiritual passion. Below are several versions of "He touched me." The first version is a digital scan of the manuscript, and this is followed by a type translation of the manuscript. 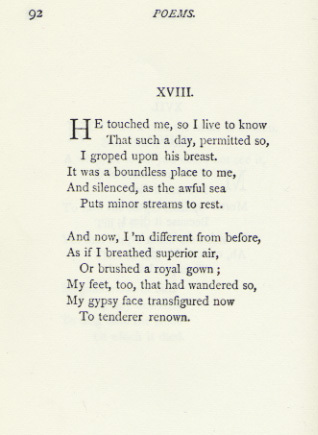 Then there are examples of various print renderings: the poem's first appearance in 1896; a 1947 magazine version that may be the first print version to include the last six lines; the 1955 Johnson version; and the 1998 Franklin version (which represents the poem as four instead of three stanzas). The poem appears for the first time, it seems, with the last six lines, in New England Quarterly 20 (March 1947), p. 22. In Poems, 1955, Thomas Johnson renders the poem in three six-line stanzas, labels it #506, and dates it c. 1862. 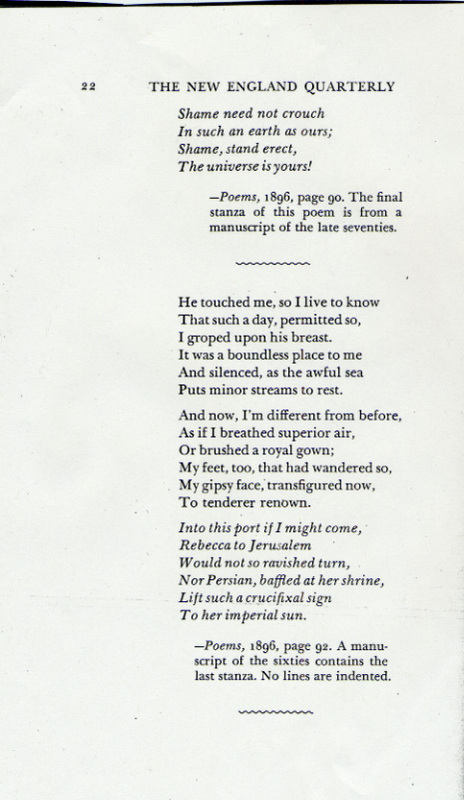 In Franklin's 1998 variorum edition, he notes that there is only one manuscript version of the poem (in Fascicle 17). He renders the poem in four stanzas--3/3/6/6--and he labels it #349. 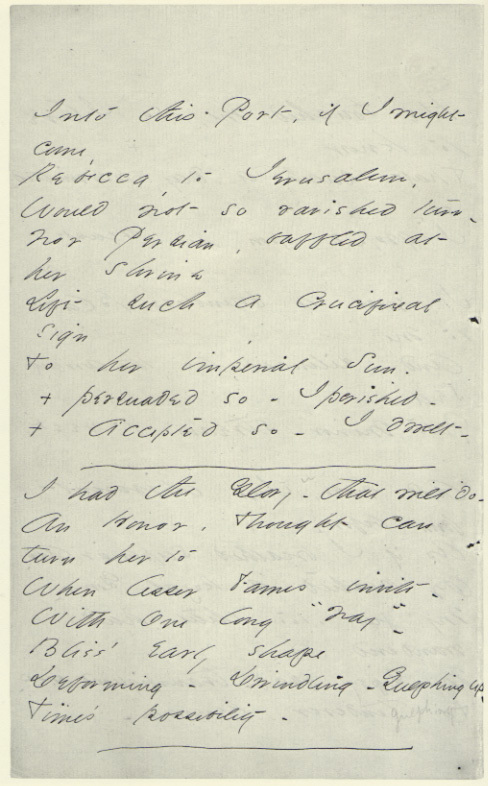 Franklin suggests the summer of 1862 as a composition date, and he notes no variants. In thinking about Dickinson's use of orientalist tropes, "It would never be Common" is worth study. My - drop - of India?